Resource center Finding Treatment for Crystal Meth Addiction What Are The Signs of Crystal Meth Abuse? How Long Does Crystal Meth Withdrawal Last? What Are The Signs of Crystal Meth Abuse? What Is a Speedball? What Are the Dangers of a Speedball? Don’t just dream about a new life. Live it. Recovery starts with a phone call. A caring Admission Navigators is available for you 24/7. Call Now. A stimulant drug that is man-made, or synthetic, methamphetamine is a powerful and potent drug that is generally found in either a powdered form or a shiny rocklike form called crystal meth. Crystal meth is typically bluish white in color and shiny, appearing like small pieces of glass. It doesn’t smell like anything, and there is no medical use for crystal meth. Desoxyn is the brand name for the pharmaceutical form of methamphetamine that can be prescribed on a limited basis for narcolepsy, ADHD, or significant obesity. The potential hazards of meth, including its potential for misuse and addiction, generally make this drug a last resort. The National Survey on Drug Use and Health (NSDUH) reports that in 2016 there were more than 600,000 people considered to be current users of methamphetamine. Almost 5.5 percent of Americans aged 12 and older have at least tried methamphetamine in one form or another as of the 2016 NSDUH, the National Institute on Drug Abuse (NIDA) publishes. The Drug Enforcement Administration (DEA) classifies meth as a Schedule II drug, which means that it is tightly regulated and considered to have high risks factors. Crystal meth is an illegal drug that may be made in clandestine laboratories and smuggled throughout the United States. It is generally smoked through glass pipes or injected when abused. Common street names for crystal meth include glass, ice, Tina, blue ice, and blade. Crystal meth is highly addictive and creates a powerful and intense high when abused that can last upwards of 12 hours. The long-lasting burst of euphoria that crystal meth induces makes it a prime target for being used as a party or club drug. Crystal meth is especially popular at raves and all-night dance parties. Crystal meth makes drastic changes to a person’s brain chemistry, increasing levels of dopamine, which is what creates the intense sense of pleasure. As a stimulant drug similar to amphetamine, which is used to treat attention deficit disorders, aid with sleeping, and promote weight loss, methamphetamine increases some of the functions of the central nervous system, too. A person will be more awake, alert, focused, energized, active, and talkative while under the influence of meth. NIDA warns that meth impacts the brain more intensely than amphetamine does, making it more potent in even lower doses. Crystal meth increases heart rate, blood pressure, body temperature, and respiration rate, and it decreases appetite and the need for sleep. To prolong and increase the high, and avoid the “crash,” people may take meth in a binge pattern, taking the drug in back-to-back doses in a “run,” NIDA explains. A meth crash can be just as intense as the high, leaving a person feeling extremely down emotionally and lethargic. Meth typically starts working in the brain and body pretty fast, especially if the drug is injected, and it lasts longer than many other drugs. Crystal meth may often be purer than the powdered form of meth; it can therefore be more potent and have intensified and prolonged effects. As a club drug, crystal meth may also be combined with alcohol or other drugs, which can amplify the effects as well as the possible risk factors, and increase the odds for a possible overdose or other dangerous side effect. A meth overdose can occur when levels of the drug become toxic in the bloodstream. The effects of a meth overdose include hyperthermia, convulsions, and possible death. The US Department of Justice (DOJ) warns that a meth high can be highly unpredictable. Individuals may experience paranoia, confusion, anxiety, insomnia, bouts of violence and aggression. Someone under the influence of crystal meth may then act in ways that are extremely out of the ordinary for them, leading to erratic and potentially dangerous behaviors, both for them directly and the people around them. 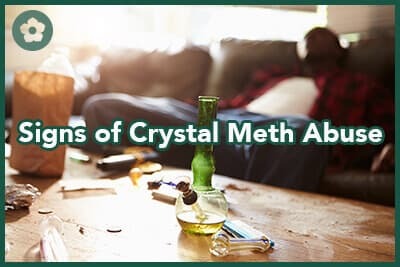 A person using crystal meth may take bigger risks than normal, have lower inhibitions, and therefore get into a situation that is, or can become, physically hazardous. Accidents, injuries, and possible criminal actions may result from meth intoxication. An altered mental state, high energy levels, lack of appetite or need for sleep, agitation and potential aggression, sweating, and restlessness are all possible signs of crystal meth use and abuse. Glass pipes, small crystal-like “rocks,” rubber tubing, shoelaces, lighters, burned spoons from melting crystal meth down, and other drug paraphernalia for smoking or injecting the drug can also indicate crystal meth abuse. Medical News Today warns that a person can struggle with addiction involving crystal meth after only a few uses of the drug. A meth high can be so intense and powerful that a person may be desperate to recreate it. After only a few uses, a person can build up a tolerance to the drug, and it will take more of it each time in order for the effect to be as intense as desired. Increasing the amount of meth taken each dose can increase the rate of drug dependence more rapidly. Drug dependence is when the brain can no longer keep regulating its brain chemicals, like dopamine, on its own because a drug like crystal meth has been interfering with the normal transmission, production, and reabsorption of them on a regular and repeated basis. Dopamine helps to regulate emotions, sleep functions, and movement abilities. High levels of dopamine in the brain make a person feel good, and low levels have the opposite effect. Crystal meth creates a surge of dopamine in the brain, elevating pleasure, but when it wears off, it can take the brain a little while to get chemical levels back to normal. Not to mention that the “normal” level of dopamine does not have the intense high feeling that crystal meth can cause. With regular use of crystal meth, the brain can really begin to struggle to maintain chemical balance, and levels of dopamine can drop really low without the drug. Meth cravings and significant withdrawal symptoms, such as insomnia, agitation, anxiety, depression, and psychosis, can all be symptoms of meth withdrawal, which occurs once physical drug dependence is built. The significance of how much meth impacts the dopamine system in the brain can also lead to memory and learning problems that can persist for months or even years after stopping meth use. The development of a movement and nerve disorder, such as Parkinson’s disease, is another possible side effect of long-term meth use. Injection drug users are also at a high risk for contracting infectious diseases, such as HIV/AIDS and hepatitis. Crystal meth is considered to be extremely addictive. In addition to the high level of physical dependence, difficult emotional withdrawal symptoms, and intense cravings, meth addiction involves an inability to control how much and how often the drug is taken. This means that someone battling meth addiction will often spend most of their time using the drug, coming down from it, and trying to figure out how to get more of it. They may give up other important things, and priorities often shift. Work, school, and family obligations are overlooked. Interpersonal relationships suffer. Social circles change to involve only those also using meth. Finances can become strained, and a person struggling with crystal meth addiction may engage in criminal behaviors and therefore have legal difficulties as well. Crystal meth addiction can have a drastic impact on a person’s life as well as on those around them. © 2019 American Addiction Centers. All rights reserved.